Transparent gaffer duct tape is a cloth reinforced tape usable for household and hobby applications; For nearly invisible repairs due to transparency; High weather resistance for indoor and outdoor use; Great for patching greenhouses, repairing glass panes and sealing hoses and pipes;1 roll of 48mm x 25m clear duct tape. The latest solution for quick, easy repairs that should go unnoticed - thats the beauty of it! This new transparent Duct Tape is strong enough to tackle almost any repair project in or around the home, vehicle, boat or job site. The clear benefit is that this tape is almost transparent when applied, making repairs less noticeable. Gaffer/Duct tape also lasts up to six times longer than other heavy-duty duct tapes, based on accelerated weathering, providing peace of mind that the repair will last a long time. Transparent Duct Tape makes your repair less obvious. It will not fall apart in extreme temperatures or harsh UV conditions like other all-purpose tapes. Transparent Duct Tape is Water and UV resistant for both indoor and outdoor use. It has been created with easy lengthwise and crosswise "tear-by-hand" convenience, making the tape user friendly. Unlike many other types of duct tape, this Clear tape unwinds and separates easily, even when the sticky sides meet. Tough repairs that are best left unseen on things such as garden chairs, suitcases, car seats and glass, are easily fixed with this revolutionary clear tape. 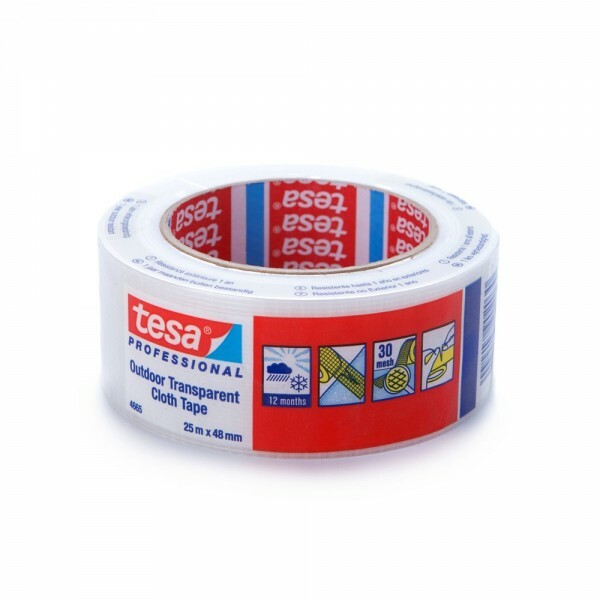 Tesa 4665 is a special transparent outdoor cloth tape. It consists of a 95 µm UV treated polyethylene film and a 30 mesh woven PET/cotton fabric backing coated with a synthetic rubber adhesive. Tesa 4665 is a special cloth tape used for different applications where long term, outdoor stability and transparency are needed. Gaffer Tape is a type of Cloth Tape also known as Duct Tape or Gaffa Tape. Gaffer tape has hundreds of uses and is an invaluable tape for use around the home, office, garage, workshop and garden. Our Gaffer Tapes are an essential tool for workmen who need strong tapes while doing there day to day duties in work areas such as building sites, refineries or in workshops. They are available in various colours and have an aggressive adhesive backing which is ideal for temporary repair work where you need to have something held firmly in place or sealed. While most of our Gaffer Tapes are suited to workmen or DIY enthusiasts.